One of the greatest things about the Volkswagen lineup is that it’s extremely versatile. Not only can you find vehicles that offer luxury, or space, but you can find more than a few that offer expectation-shattering performance. At the top of that list is the Golf R, which takes performance to a whole new level. To give you a better idea of what it is capable of, we thought it would be helpful to take a closer look at what the latest 2017 Volkswagen Golf R packs under the hood, and the numbers that its engine is able to produce. Under the hood, the Golf R comes equipped with just one engine, but the highly-capable, turbocharged 2.0-liter four-cylinder powertrain is really all that you will ever need. No other options are necessary. The engine is able to produce as much as 292 horsepower and 280 pound-feet of torque—impressive numbers for having just four cylinders. By keeping the cylinder count down, it’s also quite efficient. The Golf R is able to stretch a gallon as far as 22 miles in the city, and an impressive 31 miles when on the highway. What really separates the Golf R from some of the other vehicles on the market is the 4Motion all-wheel drive system, which not only helps when road conditions are not ideal, but that helps to improve overall performance—even on dry roads. Much of the success of the system can be attributed to the Dynamic Chassis Control system, which helps to give each one of the four wheels the right amount of power at the right time. This is one of the biggest reasons that the Golf R delivers an extremely fun driving experience. 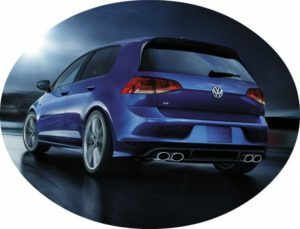 Here at Timmons Volkswagen, we don’t stock a great deal of Golf R models because we know that most Golf R buyers prefer to build out their own, to make sure that it is completely unique to them. We do stock at least one model so that you can stop in and see what it has to offer, and so you can take a test drive before going ahead and building out your own, custom version of the performance-driven Golf R.
If you have any questions about what the Golf R is capable of, or want to take it for a test drive, we highly encourage you to make the trip to our location in Long Beach to see what it is all about. As we said, our product experts can help you to build out your own, custom version of the Golf R. All you have to do is give us a call, or stop by and see us here in Long Beach. We’re always happy to help in any way we can.